Chandigarh Management Association (CMA) participated in a Workshop on Apprenticeship Training held on 13 October 2017 atHotel J W Marriott, which was organized by FICCI to sensitize industry on National Apprenticeship Promotion Scheme (NAPS) NAPS. 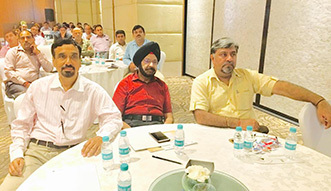 Officers from the Ministry of Skill Development and Entrepreneurship (MSDE) and Department for International Development (DFID) covered an introduction to the Apprenticeship training program of Ministry of Skill Development and Entrepreneurship, National Apprenticeship Promotion Scheme by the Government of India. Case studies of local industries and their apprentices were shared by Subros India and BHEL, Panchkula, which was followed by an interactive session with the Government officials to clear the doubts of the participants with regard to any of the Government Scheme and its implementation. The workshop was attended by a host of CEOs, Founders, HR Heads and Senior Managers from more than 65 leading organisations across automobile, food, health, infrastructure, pharma and IT sectors. Representatives from companies like Swaraj Engines, Subros India, Glenmark Pharmaceuticals, Mahindra & Mahindra and others attended the workshop. Mr Andrew Ayre, British Deputy High Commissioner, Chandigarh, India, was the chief guest at the workshop and spoke about the importance of skilling and apprenticeship training for a country to build a skilled workforce. Certain suggestions to simplify the procedure were well taken by the Ministry and the officers from Ministry assured to take its cognizance while formulating implementation plans. All together it was an informative and interactive session.